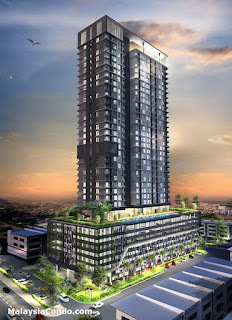 The Sky Residence @ Shamelin KL is one of the last niche high rise development nestled in Shamelin KL at Taman Shamelin Perkasa, Cheras Kuala Lumpur within the pristine and serene 60-acre Taman Pudu Ulu public recreational park. The Sky Residence @ Shamelin KL consists of a a 36-storey service apartment block with a total of 318 serviced apartment units and 8 units of shops. The serviced apartment comes in five layout types with choices of two or three bedrooms and has a built-up area ranging from 604 sq.ft. to 875 sq.ft. Facilities at The Sky Residence @ Shamelin include a 50m infinity swimming pool, wading pool, landscaped garden at level 8, gymnasium, laundrette, banquet hall, cafe, internet room and s sky garden at level 36. Built-up Area : 604 sq.ft. - 872 sq.ft.